Summerland Sweets is a local success story. One of the original food processors in the valley, the company is still today, a family owned business run by the descendants of the original founder, Ted Atkinson. Ted’s father had emigrated from the UK to Canada in the 1800′s. Ted was born in Penticton and in 1929 he moved to Summerland and made it his permanent home. Ted became the head of the food processing lab at the Federal Agricultural Research Station, (now know as the Pacific Agri-Food Research Centre) and was instrumental in the development of a number of new technologies and innovative products. One of Ted’s first products to be sold commercially was fruit jelly candies, which he developed 50 years ago out of a fruit picker’s cabin in his orchard. Ted originally created the product for the Summerland Rotary club for their fundraising efforts. Soon after, he decided to turn it into a commercial venture as well, which became a project he was passionate about in his retirement years. The Atkinson family have built their product line on a foundation of Ted’s original fruit jelly candy recipe. They now sell on a wholesale, retail and mail-order basis to towns and cities all across Canada, and from as far away as New York and Los Angeles to as close as three miles up the road in Summerland. Fruit stands and speciality shops as well as large grocery chains, are their primary market. The Summerland Sweets store, is situated three kilometers south of Summerland, near the Canyon View trestle which is the turnaround point for the Kettle Valley Steam train. When the steam train chugs up the valley, you can hear it coming for miles. The store is surrounded by orchards, country residences, stables and vineyards and is a must for any visitors to the area, in part due to it’s unique location. The store is also a frequent destination for people who are coming to see the Kettle Valley steam train. Summerland Sweets uses cherries from their own orchards and sources fruit such as pears, apples, peaches and apricots from the nearby orchards in the Okanagan area. Other fruit, not easily grown in the Okanagan, is brought in from the lower mainland. Overall their approach is to keep it as local as possible which helps support businesses in the area and in turn the locals support them. Summerland Sweets products are created in small batches in order to achieve a taste that is as close to homemade as possible. All of their products are made from their own fruit purees without added preservatives, artificial flavours or colours. The company has a small staff of loyal workers, some of whom have been there for decades, creating their delicious concoctions in the plant adjacent to the storefront. The company’s entire product line, including the pine box packaging, is crafted by hand on the premises. There is a uniqueness to their product that draws customers to it, both visually and by reputation. Everything is handled on the property, from packaging to making jam. Their plant is expansive and features a massive walk-in freezer to store the fruit, allowing them to make their products year round. The Summerland Sweets store is chock full of their products, ranging from fruit leathers to their highly sought after syrups and jams. They have recently extended the product line to include liqueur syrups which are superb on desserts, ice cream and crepes. The liqueur line ranges from Peach and Amaretto to Apricot and Brandy. There are 25 different flavours in their gourmet jams line, from the standards such as cherry or blackberry to the more unusual tea jelly flavour. 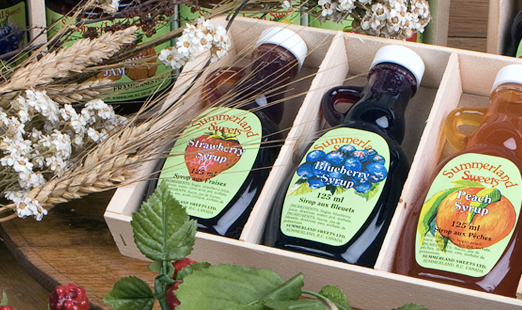 They also offer a sugar free line of syrups and jams that are sweetened naturally with fruit. Nut brittle is another of Summerland Sweets’ best sellers. It is created in small batches in a gas-flame kettle, and requires a skilled worker to swirl the candied coating onto the almonds, peanuts, cashews or pecans until the colour, texture and taste is perfected. This is a technique that hasn’t changed since brittle was first made which is said to be in the mid 1800′s. The Summerland Sweets store is also home to other products from the nearby area. There is hand-thrown local pottery, that includes charming tea pots adorned with bees or roosters, tea towels with artwork from the area as well as other local products such as a popular brand of honey from Cawston and hot sauces from the North Okanagan. The store is open year round although the hours are longer in the summer. It’s a local destination attracting about 20,000 visitors a year. There’s something charming about the old fashioned atmosphere as tourists and locals alike sit outside on picnic tables, enjoying an ice cream on a hot and lazy summer afternoon. 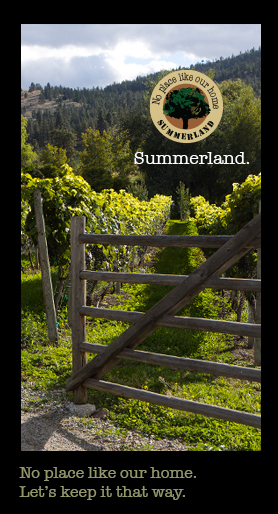 In 2008, Summerland Sweets opened a wine shop in the store – under the Sleeping Giant Fruit Winery label. They now have thirteen table wines and nine dessert wines, some of which have been awarded numerous medals. Sweetness levels range from dry to sweet and can be used on their own or as a base for drinks such as martinis, mulled wine or sangria. The winemaker for Sleeping Giant is Ron Taylor, well known for his ability to create top quality wine. The product line includes a pumpkin pie dessert wine, which has garnered a lot of attention in the dessert wine category. It’s delicious and really does taste like pumpkin pie. If you’re up in their neck of the woods, winter or summer, it’s worth the trip to stop in at Summerland Sweets and Sleeping Giant Fruit Winery. It’s a bit on the old fashioned side… and that is what makes it so charming.